On Wednesday, May 16 at 1:30, the Epsom Library will be showing the film, “Phantom Thread.” Daniel Day Lewis plays the renowned dressmaker Reynolds Woodcock in the glamour of 1950’s post-war London. His fastidious life is totally disrupted by the appearance of a young strong-willed woman who becomes his muse. Woodcock finds his normally structured life disrupted. Epsom Youth Athletic Association will be holding a Car Wash on Saturday May 12th from 8:30 - 1:30 at the Epsom Fire Station. We will also be selling 10” hanging plants. All proceeds go to Epsom Youth Athletic Association. There will be a Memorial Day Ceremony jointly sponsored by the Epsom/Chichester Elwood O. Wells American Legion Post 112 and the Town of Epsom, on Monday, May 28, 2018 at 1044 Short Falls Rd., Epsom. The ceremony begins at 0930 and will feature a guest speaker, selected ready from Epsom and Chichester school essays, Flag presentation by local scouts, recognition of deceased veterans form the towns, and the famous Epsom Town Band. Parade and refreshments to follow. Please join us for this important celebration. Notice: The Post 112 hall will be closing for six weeks beginning May 29 for repairs to the hall floor. Good afternoon everyone... It continues to be busy at the Pantry, Summer right around the corner. JR put our air conditioners in. We have to try and keep it cool for food and freezers. We have received food from the Suncook Senior Center. Thanks, so much, folks. Much appreciated. We also received contributions from Planet Aide and Mr. and Mrs. Moulton. Again, many thanks for remembering us. I remind all our gardeners, please plant a row for us. Our members are so grateful for fresh veggies. We can always use Hamburger Helper, Rice a Roni, and individual foods for the Epsom Central School Backpack program. We are so pleased to help the school children. This week, we’re meeting in session both Wednesday and Thursday, since we need to vote on all remaining Senate bills. SB 421, on insurance coverage for contraceptives, had a fairly short debate, and passed 219-111. I voted against it as an insurance mandate and also unfair, in that it carves out a segment of society for “free” medicine (no copay or deductible allowed) and discriminates against men. SB 427, on liability for asbestos related claims, was an attempt to limit this liability for companies that sold an asbestos-using company before 1972 and did not continue any asbestos related businesses. The opposition seemed driven by the search for deep pockets to pay off mesothelioma sufferers, not any concern that the responsible parties should pay. The bill was not passed, 161-175 and then killed on a voice vote. SB 569, on animal cruelty, was debated for over an hour on the committee amendment, which defined “animal hoarding,” and breeding female dog. It passed, 205-125, and the bill passed 222-111, without any discussion. SB 438, on postponing local elections, was debated at length on the comprehensive committee amendment, which dealt with every possible contingency and left all “official ballot” elections under the supervision of the secretary of state. It failed, 155-176, and we proceeded to debate the minority amendment which clarified that the moderator has the authority to postpone local elections. It passed, 178-158, and the bill passed on a voice vote. My committee’s bills all lived or died by the committee’s recommendation, with no debate except on SB 535, on licensing art therapists and using commemorative liquor bottles to fund the state house bicentennial. The committee amendment deleted the art therapy license and passed, 169-157, and the bill passed, 174-156. It’s time for the Epsom Boy Scouts Troop 80 Spaghetti & Meatball Dinner!! This years event will be held Friday, May 18 at the Epsom Fire Dept., 1714 Dover Road from 5pm - 7:30pm. Tickets are $5.00 each and will be available at the door. Once again our scouts will be serving their own homemade meatballs and sauce over a hearty serving of spaghetti, salad, bread, drink and dessert. Each dinner purchased also comes with an entry for one of our fantastic door prizes (drawing at 7:00, winner need not be present we will call). We are also offering takeout dinners if you would like to support our troop but can’t stay. Due to many generous donations, all of the proceeds will go right back to the scouts to attend programs throughout the year. If you have any questions or need more information, please contact Kelly at 435-0396 or knericcio@yahoo.com. We hope you are able to come out, meet your local Boy Scouts and have a delicious dinner with them. Thank you for your continued support! 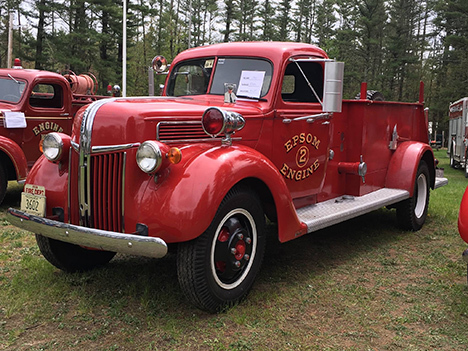 Last year’s show was a great success with over 40 pieces of firefighting equipment, both antique and contemporary, from around NH and New England. 100’s of spectators from as far away as Canada, NJ, PA, and all of the New England states enjoyed a day of seeing firefighting equipment from 1849-2015 as well as pumping demonstrations. This year’s muster & show will include a parade! This is a low speed parade, approximately 1.5 miles long for motorized apparatus. The parade will form, starting at 0900 at the Epsom Bible Church, 398 Black Hall Road, Epsom, NH 03234. The parade will leave the Church parking lot at 0945 and proceed to Webster Park via Black Hall and Short Falls Roads. This is a family friendly event and people of all ages are welcome. The Event is scheduled to run from 10AM to 2pm on May 12th, rain or shine. Currently we have well over 40 pieces of Fire Apparatus scheduled to attend from an 1849 Hand Tub to 2017 state of art apparatus. 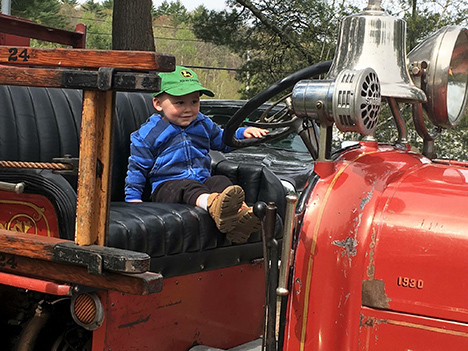 At Webster Park there will be static displays of antique and contemporary Fire Equipment, pumping demonstrations, Door prizes and trophies in 8 different categories will be awarded and of course Fire Helmets for the kids. Also The Milford NH, Firemen’s Relief Association is raffling off this custom painted Dirico Retro Flyer, valued at $30,000.This one of a kind motorcycle will be on display at the at Webster Park. Get your raffle ticket for this custom painted Dirico Retro Flyer! $100 each, no more than 300 will be sold. Winning ticket drawn at the 2018 Firemen’s Ball on May 19th. You do not have to be present to win. Epsom Fire Dept, Auxiliary, and Explorers will be selling food and beverages throughout the day. If you enjoy the fire service and history, this is a must attend event for you! A reminder that Webster Park does not allow dogs, other than service animals. On Monday, May 14, at 2:00 p.m., the Epsom Public Library along with the Chichester and Pittsfield libraries will host a “Memory Café.” Charles Yeaton, owner of Betty House Antiques, will bring along “what’s its” for the audience to identify and discuss. Attendees may bring in antique items to add to the discussion. This is an informal, social gathering for anyone with memory issues and their caretakers. Open to anyone in the area, the Café offers a chance for socialization in a comfortable setting. Refreshments will be served. The Friends of the Epsom Public Library is proud to sponsor “A Complete History of Quilts in 60 Minutes or Less” by Pam Weeks, Binney Family Curator of the New England Quilt Museum. Join us on Friday, May 18, at 7 p.m. for this engaging program. Quilting is nearly as old as cloth, and Pam Weeks will whiz though the history, concentrating on examples from the Eighteenth through Twentieth Centuries. She will debunk a few popular quilt history myths and touch on New England textile mill and technology history. Attendees are invited to bring one quilt for identification. Quilts will be arranged in chronological order and used as examples in the lecture. Pam Weeks is the author of the book Civil War Quilts as well as articles on quilt history. She lectures nationally on quilt-making and quilt history. She uses quilts to tell stories of the Civil War, women’s history, and industrial history. This program is free and open to the public. Light refreshments will be served. The Friends of the Library have hosted Ms. Weeks in the past and are looking forward to learning more about the history of quilts. Join the Friends of the Library for a group spring trip on Saturday, May 19 to the New Hampshire Telephone Museum located in Warner. We will meet at the library at 9 a.m. Cost is $5 per person if our group is 10 or more ($7 per adult and $6 for senior). We are scheduled for a guided tour of the museum covering the history of telecommunications and we will view a collection of 85 years’ worth of telephone equipment tucked into this wonderful NH museum. The tour will last approximately one hour and then for those who are interested the Spring Into Warner Arts Festival will be open until 3 p.m. The Festival includes arts and crafts demonstrations, music, farmers’ market and much more. Spring Into Warner highlights Warner’s unique place in the world. Beautiful Main Street opens up and hosts truly unique and amazing artists and artisans, musicians and farmers. Please sign up at the circulation desk. Song Bird Studio is located in Pittsfield, NH at Bill and Sandy’s home based studio where they started doing stained glass and mosaics in 2002. Bill retired from the florist business after 50 years as a Master Floral Designer and Sandy is retired after a career of 30 years in banking. They now work together as Stained Glass Artists doing stained glass, mosaics and fused glass creations. Their work has been purchased by people through out the U.S, Canada and overseas. In the years past they have won numerous First & Second Place and Honorable Mention awards for their work in local art shows. Bill and Sandy will be celebrating their 54th Wedding Anniversary in September 2018. All of us at Valley Artisans wish them well and many years of creating their beautiful stained glass together. 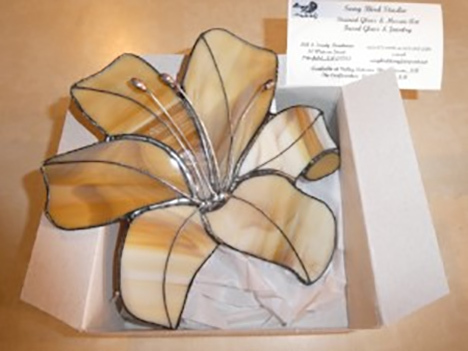 Bill has donated a stunning stained glass lily ornament for the May Artisan of the month raffle. All of us at Valley Artisans invite you to stop by the shop and check out Bill’s other stain glass items and all our other fine crafts from local artisans. We have three rooms filled with so many interesting items. Valley Artisans of Epsom is open Wednesday through Sunday from 10 AM - 6 PM. EPSOM- Mrs. Josephine E. (Davis) Aiken, 78, of Epsom formerly of Pittsfield, passed away on April 28, 2018 surrounded by her loving family while in the care of the Concord Hospice House after a period of declining health. 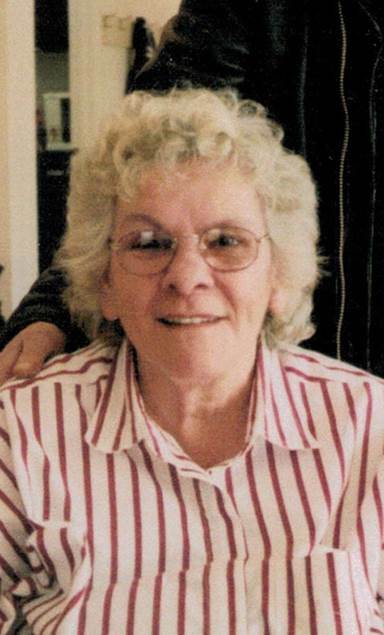 Born in Whitefield, Jo was the daughter of the late Cecil and Helen (Osgood) Davis. She was raised and educated in Plainfield and was a graduate of Windsor, VT High School Class of 1958. She attended Concord Business College until she met her future husband, Fernald G. Aiken, Jr….and the rest is history! She was predeceased by her husband, Fernald G. Aiken, her brother, Bruce Davis; sister, Barbara Davis and “the best in-laws in the world,” Hazel and Fernald G. Aiken, Sr.
She is survived by her children: Ervine Aiken and his wife Brenda of Canaan, Pauline Hallquist of Epsom, Donna Aiken of Concord and Theodore Aiken of Epsom. She was the sister of Nancy Rowell of Center Barnstead, Danny Davis of Clarksville and stepsister to Curtis Tilton of W. Stewartstown. Also survived by her seven grandchildren, seven great grandchildren and many nieces and nephews.